Researchers in the Instability and Turbulence Group of IRAMIS-SPEC have succeeded in experimentally characterizing the non linear mechanical response of an amorphous granular media across the jamming transition. They have demonstrated that global rigidity sets in via the critical growth of a correlation length. Illustration 1: Experimental Schematics. An intruder particle is dragged by a constant force through an assembly of grains.. Need a grain of advice? We've got thousands! In this experiment by the Instability and Turbulence Group, a mono-layer assembly of amorphous grains are compressed in a horizontal vibrating cell (see figure 1) until it reaches its maximum density. A transition, so-called 'blocking transition (jamming)' then occurs [1,2], at which a global rigidity in the media is achieved via the dynamic percolation of force chains. 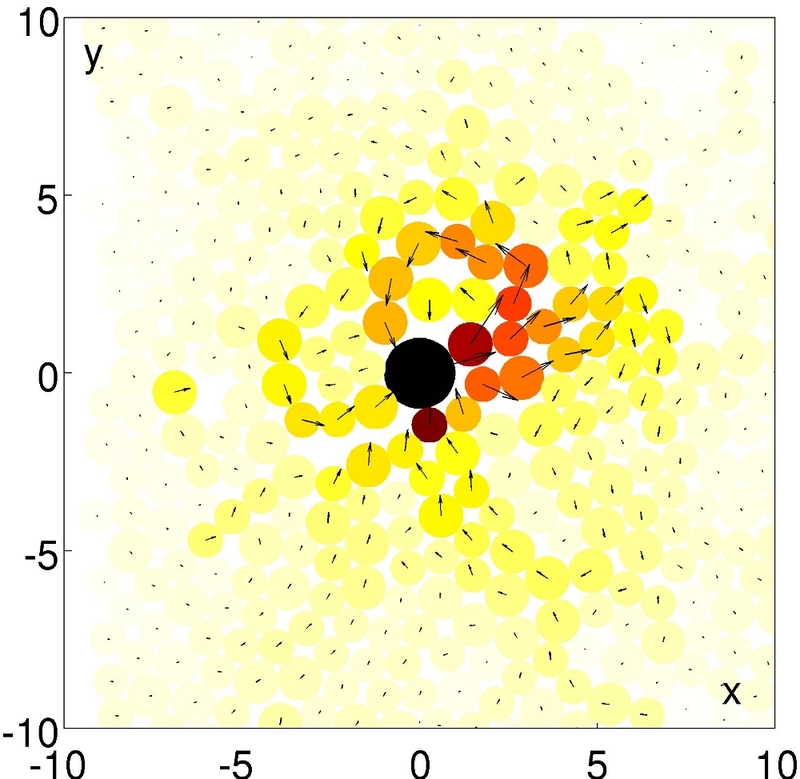 Raphaël Candelier (PhD thesis) and his colleagues have studied the subtle characteristics of such a transition by tracking one particle, "intruder," dragged at a constant force in a 2D granular media. A phase diagram has been established (figure 2), demonstrating the presence of a fluidization line, above which the "intruder" advances continuously (just as in a glassy liquid), and below which the intruder adopts an intermittent motion with a strong fluctuation enhancement close to the jamming transition. Video clip showing the strongly non-linear response presenting spatio-temporal intermittency under the fluidization line. The raw images of the grains are represented in the bottom section of the screen, while the upper section shows the treated image of the grains color coded according to their respective instantaneous speeds. One can clearly see that - very close to the jamming transition - the material « hesitates» between a very rigid state and a very fluid counterpart. Long-range reorganizations are also observed indicating the critical nature of the transition. The existence of scaling laws has been demonstrated quantitatively by a « crackling noise » type analysis. This phenomenology, explored by an original experimental procedure described here, has recently been published in two journal articles [3,4].